For the bride and groom who decide on a destination wedding in the vineyards, we offer multiple options for the bridal party and group transfers. If you are having a photo session between the ceremony and reception, our experience has been that you will require the vehicles for three hours from the time we arrive to collect the bride. For a small additional charge, we can also provide a "Getaway Vehicle" to leave your reception. To assist in making your decision, please feel welcome to inspect our vehicles. 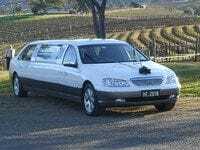 We can arrange for you to view our vehicles at work on a wedding, alternatively you may inspect our vehicles at our base at Macquarie Hills 8 am 5 pm Monday to Friday or 8 am till 1 pm Saturday. We are a thoroughly professional organization which prides itself on attention to detail. There are many "operators" vying for your wedding transport business, however, at Pokolbin Hire Cars, we pride ourselves on being THE BEST in the industry, with the newest fleet of vehicles to provide you with excellent service. Should you wish to make a booking by phone we can hold a reservation for you for 14 days. To obtain exact pricing you will need to call us or complete our information sheet. A deposit of $100 per vehicle is required to confirm your booking, with the balance payable one month prior to the wedding. For information regarding guest transport options please view our Wedding Shuttle page. Alternatively, click here to obtain a quote.